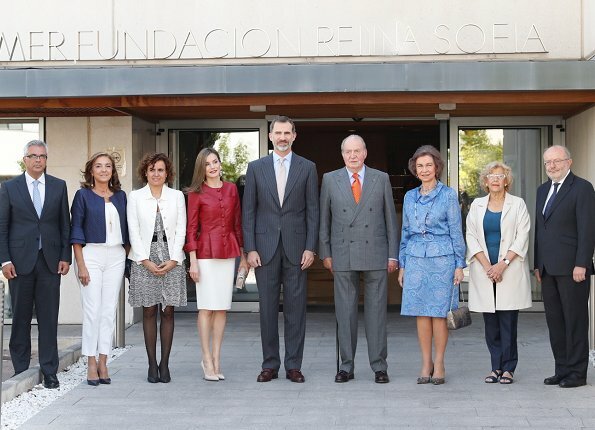 King Felipe, Queen Letizia, Former Queen Sofia and King Juan Carlos of Spain attend the 40th anniversary of Queen Sofia Foundation at Reina Sofia Alzheimer Foundation Center on May 22, 2017 in Madrid. 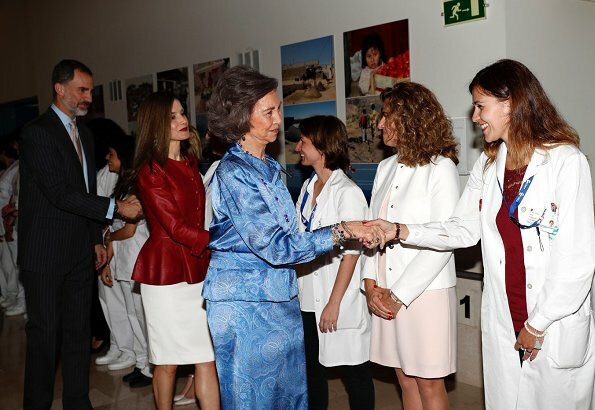 The Queen Sofía Foundation is a joint foundation, a charity of a cultural, non-profit-making and permanent nature. ¡¡Qué maravillosa chaqueta, yo la quieroooo!! 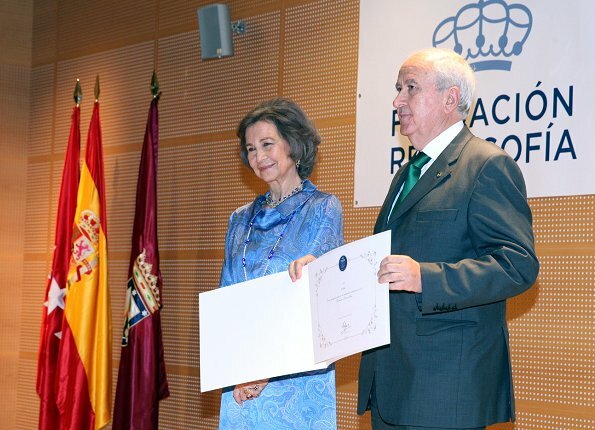 Hoy hace 13 años de la boda de Felipe y Letizia. 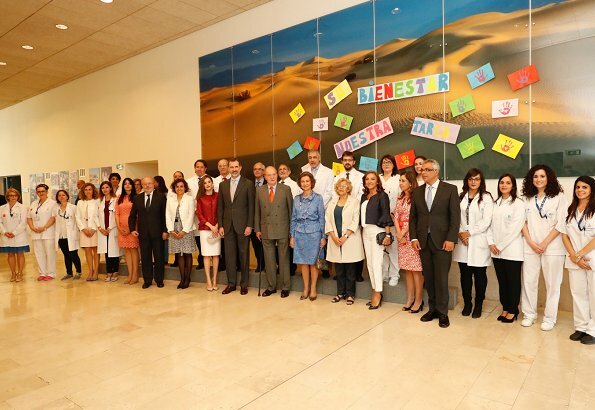 ¡¡¡Felicidades, pareja impresionante!! I just love the red leather jacket. Both ladies look great. 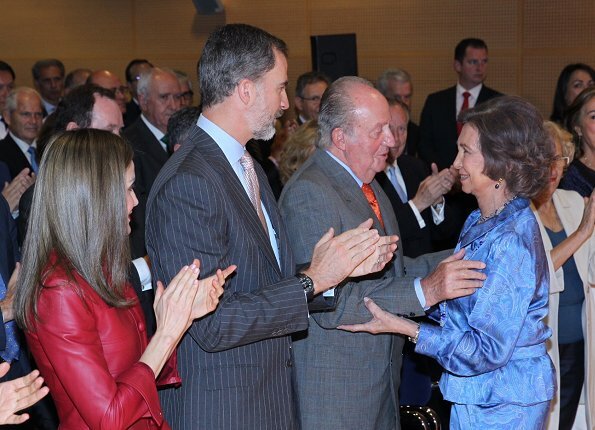 It is good to see Juan Carlos was there paying respect to his wife and her admirable work. It was about time. It wouldn't be the first pair that come together again after years of leading separate lives. The offending spouse begs for forgiveness and offended spouse grants it. In my view the winner is the forgiving one, because it takes generosity and strenght to be able to forgive. Beautiful outfit, jewellery and make up - the earrings are to die for. I think it's time for a bit of a trim of the hair - I think I spot split ends. On the third pic you can see the end of the other one. Letizia's hair has grown out so fast. Yes, a few split ends and some breakage on top, but it shows she is human and even the queen is subject to fly-aways. Beautiful color jacket on her though. Letizia looks amazing. I love that jacket. Sofia looks very matronly in that shiny fabric. The suit would have been so much nicer in a simpler fabric. 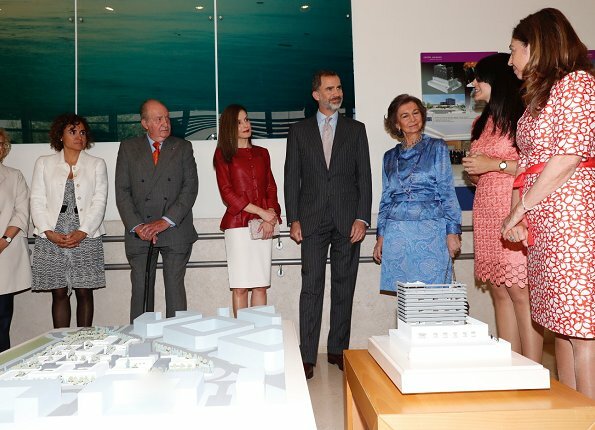 Wow, what a phantastic ""Herrera"-jacket and a fine combination on Letizia!!!!! 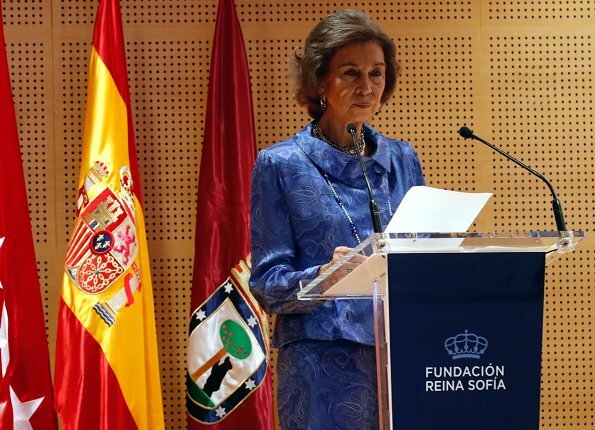 Wow, Letizia's hair grow pretty fast. TBH I prefer her with shorter, shoulder length hair. But still its good to see her changing hair styles so often, and there's always time to cut off some length. Lovely red jacket. Overall she looks very vibrant and elegant. Maybe she has some extensions to help. In fourth pic it looks like there are also shorter parts. 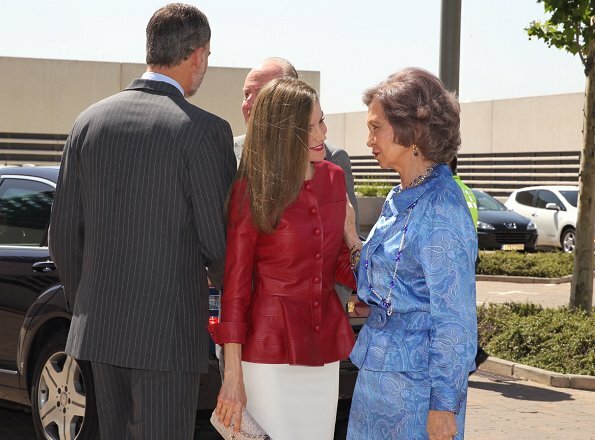 Love Letizia´s earrings here. Jacket is nice but too wintey for this time of year. This jacket is stunning, love the horizontal seams and the peplum adds the soft touch to the otherwise cold look of leather, but it is definitely a fall/winter piece, and it looks a little out of place on a sunny rather warm day. Love the shoes and bag. The earrings are precious, but not combined with leather, nevertheless she managed to look chic and gorgeous.